TextMagic is a business text-messaging service for sending notifications, alerts, reminders, confirmations and SMS marketing campaigns to your customers, staff and suppliers. "Send Professional SMS From Your Custom Sender ID"
With TextMagic, we were able to generate our own Custom Sender ID for the company within seconds, instead of using a regular phone number. I also love the automatic character calculator, which helps make sure that we have an optimal and cost-efficient campaign. Great reporting and delivery confirmation features, in the history tab, under the "status" category. I have no dislike for this amazing tool. A suggestion would be to try leveling prices for all international location, as much as possible. TextMagic is really a professional tool, with a stable platform, highly user-friendly. If there is a software that I recommend far above all ones, it is TextMagic. They are the best. Perfectly amazing experience. One last note: I love the fact that we could furthermore check the carrier (Carrier lookup) of any of the phone numbers on our contact list, further adding to building our professional contact list. We managed to consolidate our branding and marketing efforts, and promote a professional image thanks to TextMagic. "TextMagic: Professional SMS & Contact Management Software"
The SMS scheduling features is something that I find really useful. It's automated features are also great when it comes to sending generic SMS. Delivery rate is really impressive. Fast and professional customer support. And best of all, the list management and group creation features. Pricing is a little high for some locations (international). But I guess this is not under the control of TextMagic. TextMagic is a really professional company, offering great services within their text message software. I recommend without any hesitation. Try it. You have nothing to lose as you get free credits for testing. With TextMagic, I've managed to handle professional automated text messaging campaigns. What SMS Marketing solution do you use? "Simple, easy to use text service"
The ease of importing my contacts list and writing templates to use based on the circumstances. Being able to contact our entire employee body with a short text message is extremely helpful. It is a very good value for our small company. I don't have any negatives to report on. Communicating with our employees when there are severe weather issues. We let them know our status - open for normal business hours; delayed due to plowing; closed when the state closes the roads; etc. "Text Magic has proven to be a great tool in our business." Text Magic is very easy to use and the cost is minimal. The fact that it doesn't integrate with our CRM is a negative but not expected. Use it - it is very easy. We are solving the problem of missed appointments. We have utilized Text Magic to schedule reminder messages, which gives us the benefit of being able to plug it into a process and complete the task and not have to add a task to remember later. Very easy to use, much faster than phoning and we don't have a company phone on which to text. We have just realized that text magic isn't reaching an increasing number of our customers. The history states it is but the customers are not receiving these texts from us. Increasing number of customers not receiving their texts from us - even when the history shows it has been received. We have checked, texting customers while they are in store and nothing shows on their phones. This has caused us lost sales and annoyed customers as we have only just become aware how few texts are reaching the customers. We have now gone back to phoning although most customers would prefer a text. We are a company that generates leads for ourselves through marketing efforts. A customer will contact us through a web form on our website and it is our responsibilty to reach out to that customer to set up a free estimate. In this time in the world we have found it is sometimes easier to reach people via texting instead of phone calls. We do operate Monday through Friday 8a-5p so it is hard to connect with people who work during that time. TextMagic has made it possible for us. "Inviare sms facilmente dal web"
Questo validissimo programma lo uso principalmente per inviare sms ai miei clienti direttamente dal web ma inoltre la cosa fantastica è la possibilità anche di ricevere le risposte e visualizzarle dal web. Di questo programma uso solo le funzioni sms e non ho ancora provato tutte le altre funzioni. Comoda anche la funzione per ricevere sms con foto che poi posso visualizzarle dal web. L'account inoltre puo' avere anche vari profili di gestione e impostare un utente amministratore con tutte le funzionalità possibili e un utente utilizzatore con minori opzioni. Il programma funziona davvero bene e non c'è proprio nulla che non mi vada bene. E' davvero un ottimo programma ben fatto ! Un programma davvero interessante che vale la pena usare e registrarsi per iniziare con la licenza gratuita e poi acquistare credito per inviare altri sms. Abbiamo notato una grande possibilità di comunicare velocemente con i nostri clienti grazie a questo programma che ci permette anche l'uso di comodi e pratici template per inviare messaggi. il sistema di ricarica credito è fantastico e ci permette di ricaricare il conto anche di solo 10 euro e pagarli anche con il conto paypal oltre che con carta. C'è anche la funzione di ricarica automatica quando il credito è quasi esaurito ma non l'ho attivata perchè preferisco ricaricare io direttamente. "Enjoy the convenience of a PC while sending/receiving SMS"
My two main reasons for using this service are: to have a separate cell phone number for messages I don't want my actual phone to be cluttered with and the convenience of sending and receiving SMS messages from my PC. The ability to send and receive SMS via email is very comfortable, it makes it much easier to find messages inside your mail client than on your phone. Having another phone number for SMS is useful in many cases, for me, having a virtual cell phone number allows me to publish it anywhere without the worry of spam (you can always change the number if needed easily using textmagic website). I use this service for many sites and services that require phone number confirmation and I rather not share my personal phone to avoid ads and sales calls. signing up on the textmagic site was very easy, the website has a simple and clear user interface. Sending SMS messages is as easy as adding the recipient(s) and typing the message. A free trial is available (you get a few credits to test it out when you sign up). A couple of features that not all the competitors I've looked at offer are: notification if a message was not delivered successfully and the fact that your credit doesn't expire (unlike some companies that limit the time in which you can use your paid credit. The service seems to be reliable, I can't recall having an issue with it (however, I'm not a heavy user). Overall, I recommend this service to anyone. There is not much not to like about the textmagic service. While their prices are very reasonable, there are cheaper solutions available for online SMS. will cover your SMS needs either as an individual or a business. A separate cell number is useful for sharing your number online. reliable service with credits that do not expire. "Convenient. Essential for out of mobile range access." 1. The convenience of texting using a PC rather than a mobile. 2. I am based in an area with no mobile coverage thus TextMagic allows me to operate seamlessly. Nothing to dislike except that I found it initially a tad difficult to work out how to send to a group. Perhaps it was just the terminology whereby TextMagic calls it a List. Anyway I just checked and it seems OK now. Texting when I am out of mobile range (most of the time). Simple to use both via a browser and the Android app. Easy to set up. Reasonably priced. Nothing! It does what it's meant to do without fuss. I'm a coordinator for a community organisation rather than a business. So far it's helped us engage members in a way that email campaigns don't. "Great affordable and relable service." A great solution for our needs. Great support. Workable solution for any budget. MOST handy feature is everyone in the office can log in and view activity via SMS CHAT feature. Each sales person and management cam see service staff progress at all times. No CONS - We have single use. Our service staff texts in and out of every location so we know their daily progress. Live status updates from our field staff. If all service staff is compliant, we know where everyone is at all times. Eliminates the need to contact staff to obtain daily progress. Also gives us an overall method of communication that is quick and accountable. Keyboard trumps the phone any day! I find that the product helps me review and reply to SMS communication without the hassle of using the phone. No real issues, the product is well thought out. It is a great fit to my personal needs. Improves my efficiency. I find that contacts respond with immediacy and gets their attention way before an email finally comes to their attention in the inbox. "Requires a copy of your driver license of passport to use"
Easy to use. Easy to signup and create a test account. Requires a copy of your driver license of passport to activate your account. In the era of wide scale identity theft, trusting a vendor with a copy of your identity should be a last resort. Textmagic is easy to use and very useful when trying to get information from clients. Nothing to dislike. Very useful and uncomplicated. When asking clients for information, they have the list of information on their phone. No need for them to look for pen & paper to write down. "Great employee communication tool and automated texting service for businesses"
That you're not locked into a contract. You can just reload your credits balance until you need to again. I wish there was more of a CRM integration because you can create automated text scripts with keywords and could easily ask for email addresses. We are using this tool to acquire email addresses in exchange for content offers during conferences. Ease of use, service reliability and self-management. 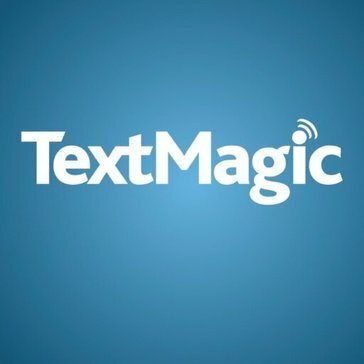 I have used TextMagic for many years and have never considered switching service provider. I have set up 2 services, one for sending SMSs via a web interface (faster, more convenient than using phone), the other is an alert sevice for our calendar where you set up what SMS alerts you would like to receive for certain events. Been using this software about 3 years now. No hickups, bugs noticed - works fine and it's easy to use. I would like better contacts editor, contacts finder and easier sending to multiple contacts. And possible to edit and save message templates. We inform our customers when it's possible to pickup their orders or notice them about orders. You shouldn't have feature listed as option if you don't intend to offer it. "Easy to set up and offers just what we need!" Easy to set up - and gives us SMS text messages about new bookings. We do not use the full functionality of TextMagic, so there's nothing we dislike - as it does exactly what we need it for! The SMS message we receive gives us a 'back up' if the email to confirm bookings somehow gets lost. "Text Magic is a very useful asset to my business"
Forward planning at its best. I use the scheduled texts consistently. Need to know more about other features. There's nothing to dislike. What I have used is great and very handy. Easy work and settings....also work with no problem. I use alarm security modules which sends e-mail for certain problems in system. I convert that e-mails in SMS now, with no problem using TextMagic service. I am always at my computer, I never have my phone on if I can help it. People who text from phones can get hold of me and never know it is not my phone they are texting. TextMagic PHP API is wonderfull. I make my own web interface and now I can send and receive SMS messages from my computer or laptop. In this way I avoid to use the phone's small "keypad". I do not know? Everything is ok. Maybe, little more working programming samples. I can use my universal addres book (mySQL) with TextMagic and share contact information of other programs too. "Text magic - Great product"
* We monitor all TextMagic reviews to prevent fraudulent reviews and keep review quality high. We do not post reviews by company employees or direct competitors. Validated reviews require the user to submit a screenshot of the product containing their user ID, in order to verify a user is an actual user of the product. Hi there! Are you looking to implement a solution like TextMagic?